Just a day before, the groceries she bought at the same outlet were packed in plastic bags. That was the norm in Kenya until August 28, when the government effected a ban on the use, manufacture or importation of plastic bags. It took effect after a six-month compliance window contained in a February 28 gazette notice by the Environment Ministry, lapsed. There are, however, exemptions to the ban…“extended for bags used for industrial primary packaging, where the product is in direct contact with the plastic and is done at the source. “Flat bags used as waste liners for hazardous waste, including medical waste and chemicals and regular waste garbage bin liners, are also exempt from the ban,” the National Environment Management Authority (Nema) said in a statement. The Environment Ministry has announced hefty penalties for non-compliance. Those found selling, producing or using the banned plastic materials will be arrested and charged, risking imprisonment of up to four years, or a fine of between $19,417 and $38,834. Across urban areas, hawkers celebrated the boon of selling bags made from alternative packaging materials including biodegradable paper and cloth. Inside supermarkets, the cost of acquiring the eco-friendly bags and supply hitches forced some retail outlets to limit the number per customer. 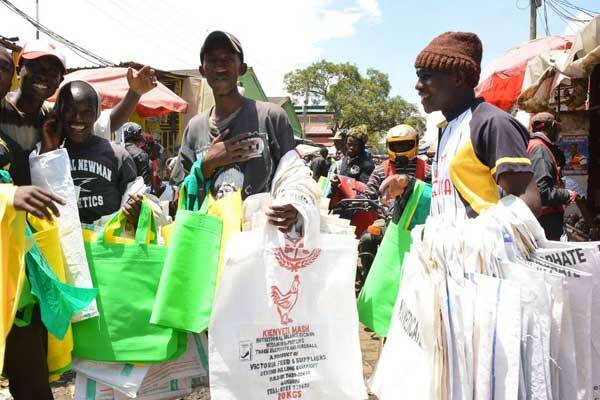 Most supermarkets in Nairobi charged their customers between $0.05 and $0.3 per bag, while others encouraged them to bring their own shopping bags. Conservationists lauded the implementation of the ban, promising to support the government in making it a success. In statements sent to newsrooms, the Green Belt Movement and Greenpeace Africa said the ban was an indication that Kenya had come of age on environmental consciousness. “We welcome the decision by the government to implement the plastics ban,” said Greenpeace Africa executive director Njeri Kabeberi. Plastic bags have been a scourge in many places across the globe. Prior to the Kenyan ban, data shows that up to 86,000 plastic bags were being handed out in Nairobi every day while 24 million were used in the country every month, half of them ending up in the environment due to poor disposal. 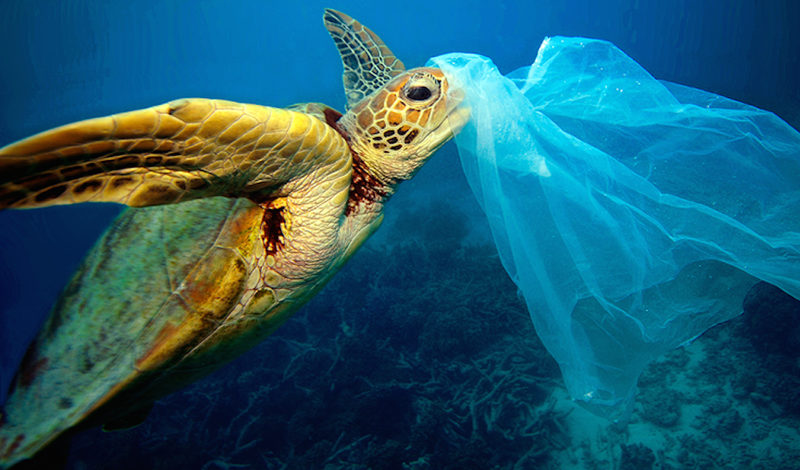 According to environmental experts, plastic bags take more than 100 years to decompose, thereby posing adverse effects to the environment including piling up in landfills, blocking drainages, polluting rivers and destroying marine life. In 2016, for instance, Lake Nakuru National Park collected 24 tonnes of plastics from the lake and its and rangelands which are grazing fields for the park’s herbivores. Plastic bags are a major contributor to the 8.8 million plastics that leak to the seas every year, posing a threat to marine life. 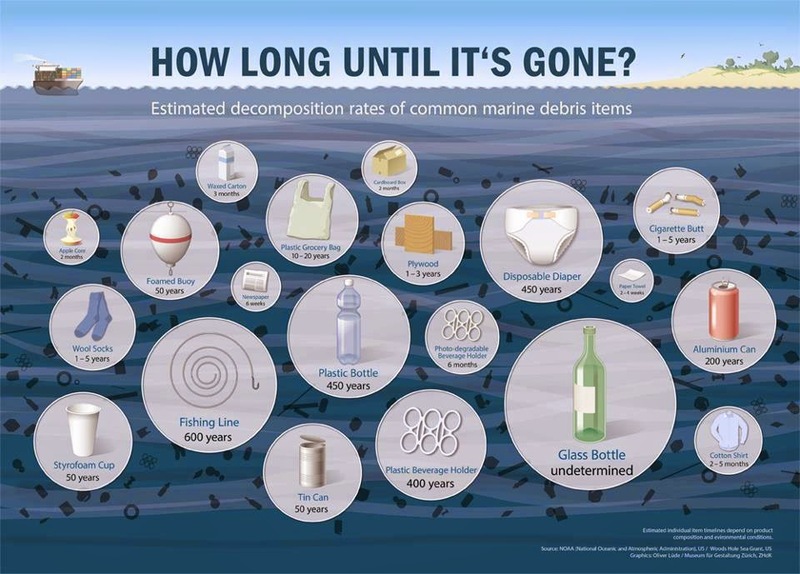 According to the United Nations Environment, there will be more plastics than fish in the seas by 2050. Kenya joins 15 other African countries that have either adopted or proposed such bans including Rwanda — the pioneer on the continent. Globally, Rwanda was one the first countries to ban plastic bags in 2004, when it prohibited shops from using them as packaging material, and introduced tax breaks to encourage manufactures to recycle, while Kenya and the rest of the world still fumbled and stumbled on how best to tackle the menace. Four years later, the country imposed at total ban on non-biodegradable polythene bags in a bold move that began to bear fruits a few months later when the UN Habitat declared Kigali Africa’s cleanest city. Rwanda’s success is attributed to well-designed policies which involved community sensitisation and the harsh rules that include thorough airport and border point searches to prevent smuggling. 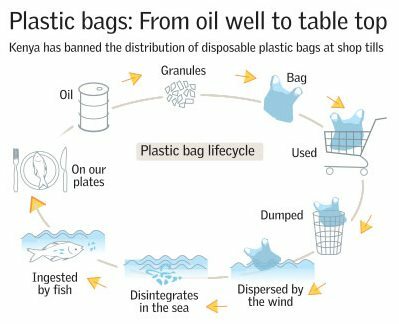 Tanzania’s first attempt to do away with plastics was in 2006, when it introduced a blanket ban on plastic bags and bottles. While the ban did not take off, Tanzania has constantly been developing policies and passing laws aimed at phasing out the use of plastic bags in the country which have mostly crippled due to poor implementation. The latest ban which was issued in mid-2016 with a January 1 deadline has since been pushed back due to lack of adequate stakeholder consultations. In Ethiopia, manufacturers and traders are banned from manufacturing using or importing plastic bags of less than 0.3 milligrammes, while conflicting business interests and environmental concerns have stalled the implementation of the ban imposed seven years ago in Uganda. It is expected that Kenya’s move to implement the ban will serve as major boost to similar efforts by the East African states to rid the region of plastic bags. In June, the East African Legislative Assembly finally passed the EAC Polythene Materials Control Bill 2016 that seeks to impose a complete ban on the use, manufacture and importation of plastic bags in the East African Community after stagnating for five years. However, as the Kenya government celebrates its triumph over plastics and begins its journey towards a plastics-free environment, not everyone is on board. In Nairobi, some plastic bag manufacturers have closed their operations as the authorities move to enforce the ban. “We are losing about $1.8 million every month,” a director at Hi-Plast Industries Raju Patel told The EastAfrican. Another director at Laneeb Plastics Ltd Dipak Shah expressed the same concerns. “This is a waste management problem. Banning plastics is not the solution,” said Mr Shah. Small-scale traders have also had to find innovative ways of packaging their wares including groceries and meat. Miraa retailers have said the alternative packaging is compromising the quality of their goods as it is prone to drying up.